sound restoration, editing and mastering in 2014 at Audiomoto, Berlin. 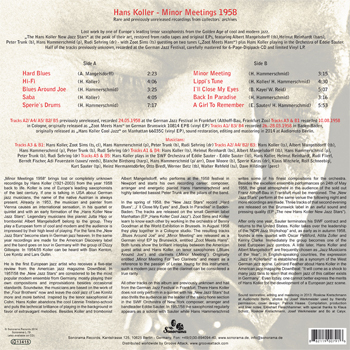 "Minor Meetings 1958" brings lost or completely unknown recordings by Hans Koller (1921-2003) from the year 1958 back to life. Koller is one of Europe's leading saxophonists of the last century. If one is talking in USA about German jazz musicians, the name of the native Austrian is always present. Already in 1953, the musician and painter from Vienna causes an international sensation, in his quartet or quintet and with an early formation of the "Hans Koller New Jazz Stars". Legendary musicians like pianist Jutta Hipp or trombonist Albert Mangelsdorff belong to the group. They play a European form of cool and modern and the audience is impressed by their high level of playing. For the fans the "New Jazz Stars" become stars in German jazz heaven. In the same year recordings are made for the American Discovery label and the band goes on tour in Germany with the group of Dizzy Gillespie. In 1954/55 Koller can be heard with Stan Kenton, Lee Konitz and Lars Gullin. He is the first European jazz artist who receives a five-star review from the American jazz magazine DownBeat. In 1957/58 the "New Jazz Stars" are considered to be the most popular modern ensemble from Germany, mostly playing their own compositions and improvisations besides occasional standards. Soundwise, the musicians are based on the work of the “Four Brothers” now and leave the cool jazz of Lee Konitz more and more behind. Inspired by the tenor saxophonist Al Cohn, Hans Koller abandons the cool Lennie Tristano-school and puts the technical brilliance of playing in the background in favor of extravagant melodies. Besides Koller and trombonist Albert Mangelsdorff, who performs at the 1958 festival in Newport and starts his own recording career, composer, arranger and energetic pianist Hans Hammerschmid and highly talented bassist Peter Trunk are the pillars of the band. In the spring of 1958, the “New Jazz Stars” record "Hard Blues", "I` ll Close My Eyes "and" Back In Paradise” in Baden-Baden. The tracks are released on the small German label Manhattan (EP "Hans Koller Cool Jazz"). Zoot Sims and Koller learn to know each other by working in the orchestra of Benny Goodman at the World Exhibition in Brussels. In August 1958 they play together in a Cologne studio. The resulting tracks "Blues Around Joe" and "Minor Meeting" are released as a German vinyl EP by Brunswick, entitled "Zoot Meets Hans". Both tunes show the brilliant interplay between the American guest artist and Hans Koller, on tenor saxophones ("Blues Around Joe") and clarinets ("Minor Meeting"). Originally entitled "Minor Meeting For Two Clarinets" and meant as a reference to the passion of Lester Young for this instrument, such a modern jazz piece on the clarinet can be considered a true rarity. All other tracks on this album are previously unknown and hail from the German Jazz Festival in Frankfurt. There Hans Koller does not only perform in a quintet with his "New Jazz Stars" but also thrills the audience as the leader of the saxophone section in the SWF Orchestra of New York composer, arranger and bandleader Eddie Sauter. In 1957/58 the saxophonist regularly appears as a soloist with Sauter while Hans Hammerschmid writes some of his finest compositions for the orchestra. Besides the excellent ensemble performances on 24th of May 1958, the great atmosphere in the audience of the sold out Franz Althoff-Bau in Frankfurt must be mentioned. The "New Jazz Stars" perform at the same venue the following night and more recordings are made. Three tracks of that second evening are released on the Brunswick label in an awful sound and pressing quality (EP "The new Hans Koller New Jazz Stars"). After only one year, Sauter terminates his SWF contract and returns to the United States. 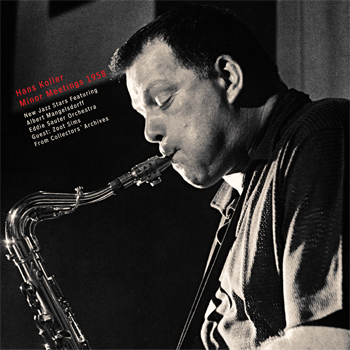 Koller takes over the leadership of the “NDR Jazz Workshop” and, as early as in autumn 1958, founds a new quartet with Oscar Pettiford, Attila Zoller and Kenny Clarke. Immediately the group becomes one of the best European jazz combos. A little later, Hans Koller and Albert Mangelsdorff are frequently chosen as "Jazz Musicians of the Year". In English-speaking countries, the expression "Jazz in Kollerland" is established as a synonym of the West German jazz scene. Leonard Feather about Hans Koller in the American jazz magazine Down Beat: “It will come as a shock to many jazz fans to learn that modern jazz of this caliber exists in Germany”. Even today, one cannot better express the merits of Hans Koller for the development of a European jazz scene.